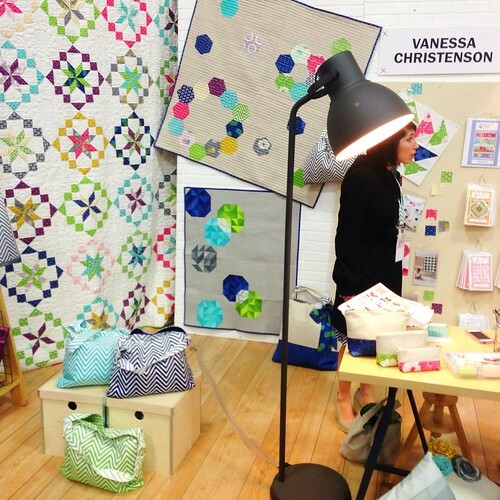 Spring Quilt Market was this past weekend in Portland, Oregon, full of inspiration + fun + very little sleep. This was my second Quilt Market and a little less overwhelming than the first! I left the Midwest on Wednesday morning just in time for a quick trip to IKEA and booth set up with Jeni and Christina. We painted, assembled IKEA furniture, and laughed our butts off every step of the way! Jeni was deputing her upcoming fabric line with Art Gallery Fabrics, Nordika -- it's adorable! Turns out I didn't take any pictures of the finished booth -- whoops. Luckily Jeni shared a few pictures on Instagram -- here, here, and here. 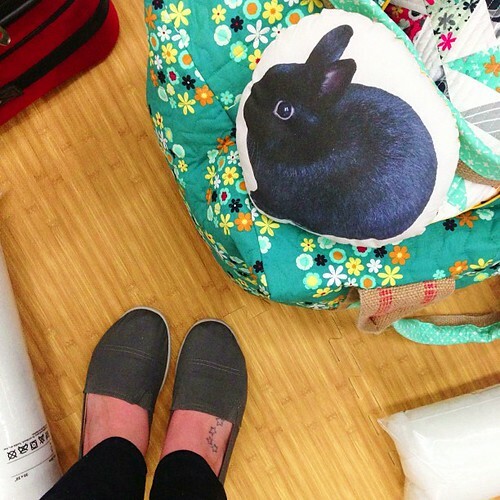 George bunny even came along to Quilt Market! Thursday I spent most of the day helping my Iowa pal Vanessa set up her booth in the Moda Fabrics section. Her new fabric, Simply Style, should start shipping in the next month or so! This color + print is my favorite from the entire collection! Vanessa & I shared a room together -- which was super fun, until one night when we both lost our hotel keys. I think we had everything (plus the kitchen sink!) 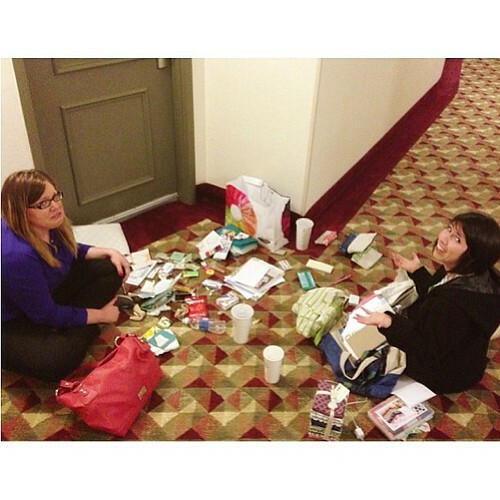 in our bags + purses except that darn room key! Ah, well -- memories made! 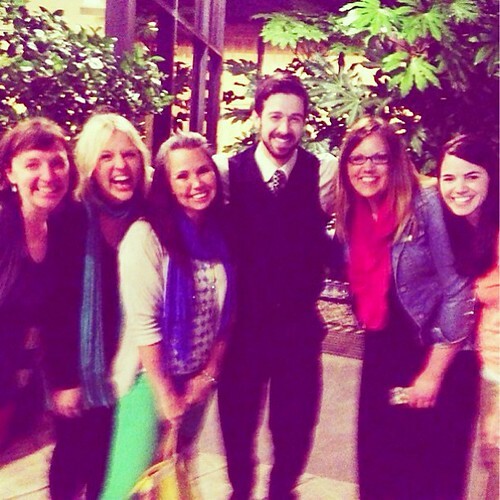 It was great getting to see + spend time with online friends, new & old! Especially when a Ryan Gossling look-a-like shuttles you around the city. Hey girl, I'd love to shuttle you around Portland for Quilt Market. 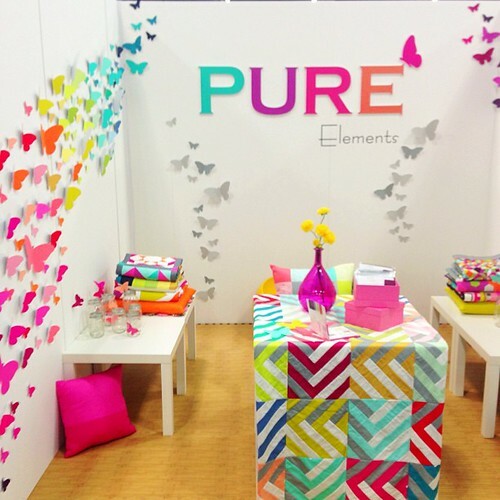 One of my favorite booths was the Art Gallery + Pure Elements booth. Simple + clean + rainbow color <3 <3 <3 What do you think the boyfriend will think of a rainbow butterfly installation like that on our wall? The cutest booth award goes to Jodi & her daughter Jemma of RicRac. Not only do they make the most adorable plush softies but they also have the best Australian accents! I could have sat & listened to them talk for hours! All in all, it was a wonderful weekend. I walked away with new friends + inspiration + motivation. 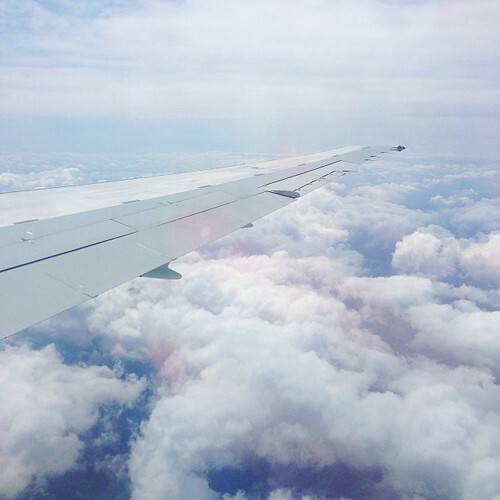 The number one lesson learned from this past week: make it happen. 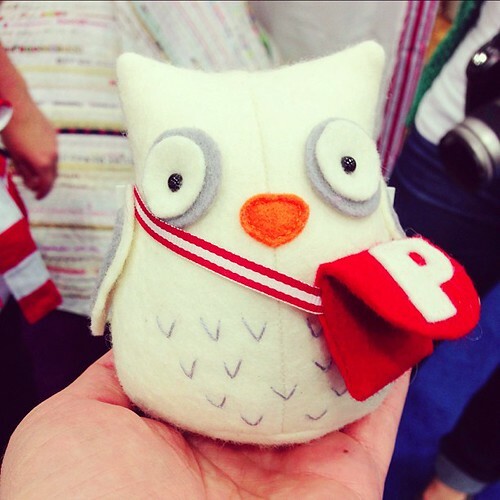 great pics Megan, I loved following Quilt Market on everyone's instagram pics, and now blog posts. I hadn't seen any pics of the Art Gallery booth, it looks gorgeous. And that's so great that you met the awesome Jodie from Ric Rac. She's so talented + funny. I haven't met her, but we went to Ballarat Patchwork while on hols down in Melbourne last year - Emma has such a fab display of all Jodie's creations, plus some of the special materials you need to make them. I bought a couple of patterns, and some 'doctor's flannel', so I'm all ready to make something ... gotta keep working through the sewing list. Cat.